4 x Royal Tudor Ware Botanical Blue and White Cereal / Dessert Bowls. Dispatched with Royal Mail 2nd Class. The “Buy it now” button has been replaced with “Add to basket”. Vintage Staffordshire Ironstone Chef Ware Three blue Bands on white Cream Milk jug. Measures approx 12 cm tall by 12 cm wide including the handle and spout. Includes U.K. delivery. Global shipping is available. Cash on collection welcome. Thank you for viewing. Set of 4 Broadhurst Pottery Blue and White Dessert Bowls Made of Ironstone. Measure 19cm in diameter. Lovely set of bowls in good condition with no chips cracks or crazing. Thelwell 1967 Ponies Mug. Good condition. 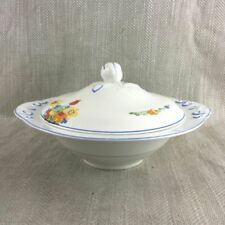 Collectable vintage bowl...I think it is for sugar. Stamp has: Image 70 Iona Staffs England In very good condition. Please view all photographs as these form part of the description. Used 9" Churchill restaurant plates in fairly good condition, just need a clean from dust and they will be as good as new. Taunton Vale. Ceramic Jug. Milk & Dessert Tableware 1litre. English Made 1960's to 1970's. Orange & Yellow Design. This is one of two lots from this range finishing one after the other. I prevent breakages by wrapping parcels with care and using a size of box that allows space for protection. I recycle where I can. 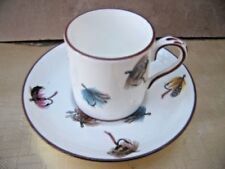 The cup is approx 3"(7.5cm) tall and approx 4" (10cm) wide including the handles. The saucer is approx 5.5"(14cm) wide and the side plate is approx 6.5"(16.5cm) wide. This beautiful set, pattern number 8368, is decorated with red and yellow roses and gold trim around the edges and on one side of the sculpted handle. From a recent house clearance. May have scratches. This is a lovely1970s retro individual ironstone soup bowl byStaffordshire Potteries Ltd. It is in a stylised floral pattern of the period in a turquoise blue/brown colourway. The bowl has a single side handle. Antique Staffordshire Begging Spaniel Dog Jug Pitcher 19th Century. Dispatched with Royal Mail 2nd Class. 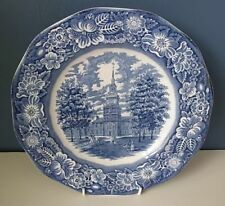 Staffordshire Plate Liberty Blue Old North Church Colonial Historical Scenes. Condition is Very good more details on photos. Dispatched with Royal Mail 2nd Class. Set of 3 very attractive pasta bowls. Salem China Co. "Colonial Village". Blue & White Dinner Plate. Collectable Round. the back edging ~ these look old! English Ironstone. Four side or tea plates by Churchill in striking blue & white Finlandia pattern, Myott's version of the classic Blue Denmark pattern. Pretty scalloped edging. 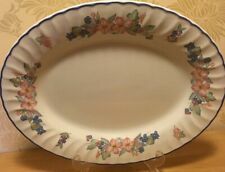 Churchill Group acquired Myott Potteries in 1991 and continued production of their more popular patterns; these plates have a similar scalloped edging to the Myott version but are very slightly smaller and the blue colour is a little deeper. Hexagonal antique Staffs. Otherwise good. This is a small Chef Ware jug probably dateing from around the 1950s. The jug is all sound other than a small chip to the base(see pic). A single dinner plate by Churchill in striking blue & white Finlandia pattern, Myott's version of the classic Blue Denmark pattern. Pretty scallopped edging. Churchill Group took over Myott Pottery in 1991 and continued production of its more popular ranges; this plate matches the size and pattern of a Myott dinner plate I also have listed (the blue is a slightly deeper colour on this one). Churchill Staffs Blue & White Skating Scene Set 4 Dessert Plates 8" Diameter. Pretty and useful plates to expand an existing set, Would Display well on a dresser. More available in this pattern. Within the UK sooner. ~~~~~~~~~~~~~. ~ OLD WILLOW DEEP SERVING BOWL ~. S. Ltd ~ Made in England. Couple of blue dots and blue marks under glaze from manufacture. Excellent example in very good condition. More available in this pattern. ~~~~~~~~~~. Maker: CHURCHILL. 4 x WILLOW DESIGN TEA PLATES. Elizabethan Charmaine 16.4cm Diameter Tea Plates. Set Of 6. Superb Condition. B.